This past weekend 18 athletes from Royal City Track and Field Club travelled to Nanaimo to compete in the Provincial Junior Development Track and Field Championships for athletes between the ages of 9-13. The Clubs athletes reached amazing heights with many personal best performances achieved over the course of the weekend. The club walked away from the meet with a total of 50 awards made up of 18 medals and 32 additional top eight finishes. Katelyn Stewart Barnett was the provincial champion in the 10 year old girls 1000 meter run, winning the event with a time of 3:37.71. Silver medals were won by Grace Fetherstonhaugh in the 2000 meter race, Devin Strome in high jump, Jenevieve Patry-Smith in javelin, Ryan Jensen in the 80 meter hurdles, Jeremy Belcher in the 100 meter dash, 200 meter hurdles and long jump, Emmanuel Dadson in pole vault and Tomas Ward in shot put. The 11 year old girls distance medley relay team made up of Michelle Dadson, Anaiyah Bernier, Lauryn Savela and Elizabeth Bowles also won silver. Bronze medals were won by Katelyn Stewart Barnett in both the 600 meter run and high jump, Grace Fetherstonhaugh in the 1200 meter, Jenevieve Patry-Smith in shot put, Michelle Dadson in Discus and Ryan Jensen in the 200 meter hurdles. The 10 year old girls 4×100 relay team made up of Kaia Polanska-Richardson, Annette Scott, Malena Kalisch and Katelyn Stewart-Barnett took bronze as did boys 13 year old relay team made up of Jeremy Belcher, Ryan Jensen, Tomas Ward and Emmanuel Dadson. There were an additional 32 top eight finishes achieved by the following club athletes: Anaiyah Bernier, Malena Kalisch, Elizabeth Bowles, Amanda Scott, Grace Fetherstonhaugh, Devin Strome, Jenevieve Patry-Smith, Michelle Dadson, Brianna Bates, Joelle Pinvidic, Lauryn Savela, Ryan Jensen, Emmanuel Dadson, Jeremy Belcher and the 13 year old girls relay team made up of Brianna Bates, Grace Fetherstonhaugh, Amanda Scott and Devin Strome who placed 4th in both the distance medley relay and the 4×100. Also worth mentioning, the following athletes met B.C. 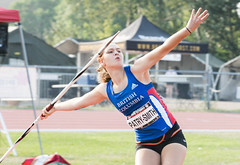 Athletics Awards Standard: Grace Fetherstonhaugh in the 2000 meter and Jeneviève Patry-Smith in both javelin and discus. 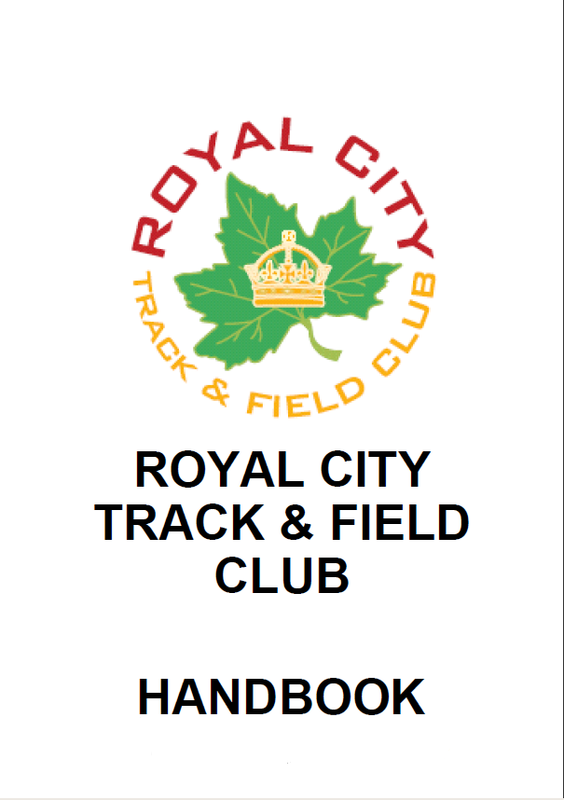 Over the July 1st long weekend, a group of Royal City Track athletes attended the 2013 Jack Brow Memorial Track Meet in Kelowna. 9 year old rookie, Kaia Richardson Polanska, competed in the 60m dash, 60m hurdles, and shot put. David Patry-Smith, competing in the 10 year old boys category, ran the 600m, 60m hurdles, high jump, long jump, shot put, and discus, coming away with a top 8 ribbon in all but one event. 11 year old Anaiyah Bernier made the rounds in all the event areas competing in the 60m, 200m (winning a bronze medal in both,) 100m, 600m, high jump, long jump, and shot put. Jeremy Belcher, representing the 12 year old boys, took home a bronze medal in the 100m, 200m and long jump, a gold in both the 300m race and 200m hurdles, and he also competed in the javelin. Also representing the 12 year old boys, Shea Janke, took home a pair of bronze medals in the 800m and 1200m races. Devin Strome, the only 13 year old girl from the club, collected a silver medal in the 200m hurdles, broke a pesky personal best in the high jump to win gold with a jump of 1.45m, and repeated the gold medal performance in long jump. She also competed in the 300m. A year up, newcomer, Sarah Chandler, competed in the 200m hurdles and long jump. Her hurdles performance earned her a 7th place ribbon. 16 year old Kinsey Weir, competed in the 100m hurdles, triple jump, and pole vault. She won silver in the vault and placed 5th in triple jump. And last but not least, coaches, Alex Bouzane and Kevin Smith kept their tradition of competing in the vault at the Jack Brow alive. They both took home medals in the 40-44 age category, with Alex taking the competition with an impressive jump of 4.00m and Kevin finishing second with a jump of 3.20m.